Summertime, and specially August, is a period of big choices: either you kick back all the time, doing nothing but eating, laying down on the beach (if you're lucky) and watching sport on TV (by the way, watching people sweating won't make you lose weight); or you can get back on track and use your time at best to improve your shape (or, if you are an ambitious runner, your personal bests). I made up my mind for the second option, literally. After many years of absence from an athletic track, three days ago I set foot in a 400-meter ring to run the 5k distance. I had forgotten how great it feels to run on tartan, even without spike shoes. 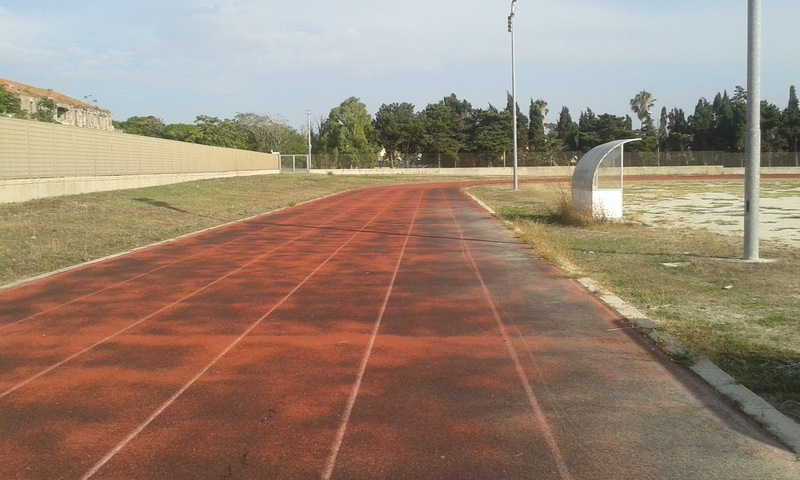 The track is actually in poor condition (see picture below). I found it by chance inside an old structure, now abandoned and attended by a few local sprinters. However bad, it has an advantage: it is situated 5 minutes away from my summer-house and it is always open! As said, I wanted to try running at first a 5K, as so far I've timed all my previous performances on a 500-meter circuit which is not completely flat, therefore my PBs cannot be considered "official". Moreover, a doubt has always been nailing me: how fast could I run in a real track? This month I have finally the chance to find it out! I concluded my first 5K in 22:25, not bad. But I can do better. My task is to run 5K in 20 minutes in a track by the end of August 2016. Will I make it? I'll keep you posted!